University of Massachusetts Press, 9781625342652, 288pp. 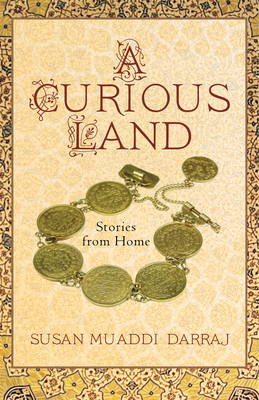 Susan Muaddi Darraj's short story collection about the inhabitants of a Palestinian West Bank village, Tel al-Hilou, spans generations and continents to explore ideas of memory, belonging, connection, and, ultimately, the deepest and richest meaning of home. A Curious Land gives voice to the experiences of Palestinians in the last century. When Rabab lowered the magad and clapped-clapped to the well in her mother's too-big slippers, the stone jar digging into her shoulder, she didn't, at first, see the body. The morning sun glazed everything around her -- the cement homes, the iron rails along one wall, the bars on the windows, the stones around the well -- and made her squint her itchy eyes. She was hungry. That was all. They'd arrived here only last night, stopping as soon as Awwad and the men were sure the army had moved south. It must have been the third time in just a few weeks -- collapse the tents, load the mules, disappear into the sands. She hoped this war would end soon, and she didn't really care who won, as long as it ended because they hadn't eaten well in two years. In the past few months, her mother had sold all her gold, except for her bracelet made of liras. It was the only thing left, and she was holding onto it, and Rabab realized, so were they all; she imagined that, the day it was sold, when her mother's wrist was bare, would signal that they were at the end. Susan Muaddi Darraj's stories, essays, and reviews have appeared in New York Stories, Orchid Literary Review, Banipal, Mizna, al-Jadid, and several anthologies. Her previous short story collection, The Inheritance of Exile, was honored by the U.S. State Department's Arabic Book Program. She is a recipient of an Individual Artist Award from the Maryland State Arts Council. A Philadelphia native, she currently lives in Baltimore.